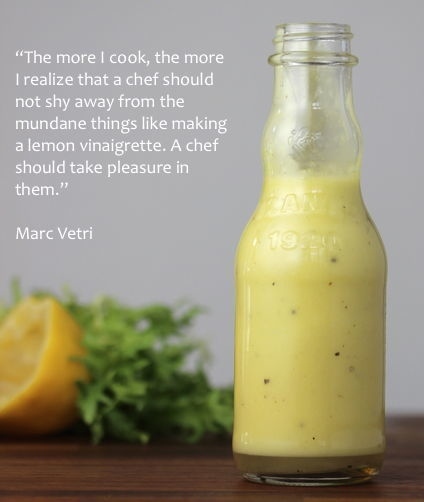 Paying attention: vinaigrettes, onions, etc. To cook is to engage with small things. It has to do with paying attention to the detail. However grand the result might be (or not be, for that matter), a recipe is an accumulation of small steps. As any good cook will attest, the quality of the end product is a direct consequence of one’s attention to the incremental. Vinaigrettes included. I suspect the same is true in many pursuits. It is certainly so in theology. In his book The Supper of the Lamb, the late Robert Farrar Capon — a theologian and cook of equal passion — dedicates an entire chapter to the onion. His point is beautifully made and well worth the cost of the book. It is a call to attention, in cooking and in life. Here is just a small extract. Next take one of the onions (preferably the best-looking), a paring knife, and a cutting board and sit down at the kitchen table. Do not attempt to stand at a counter through these opening measures. In fact, to do it justice, you should arrange to have sixty minutes or so free for this part of the exercise. Admittedly, spending an hour in the society of an onion may be something you have never done before. You feel, perhaps, a certain resistance to the project. Please don’t. As I shall show later, a number of highly profitable members of the race have undertaken it before you. Onions are excellent company. Once you are seated, the first order of business is to address yourself to the onion at hand. (You must resist the temptation to feel silly. If necessary, close the doors so no one will see you; but do not give up out of embarrassment.) You will note, to begin with, that the onion is a thing, a being, just as you are. Savor that for a moment. The two of you sit here in mutual admiration. Together with knife, board, table, and chair, you are the constituents of a place in the highest sense of the word. This a Session, a meeting, a society of things. 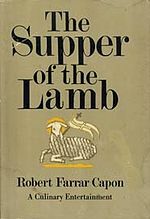 Robert Farrar Capon, The Supper of the Lamb: A Culinary Reflection, New York: Doubleday, 1969, 11. 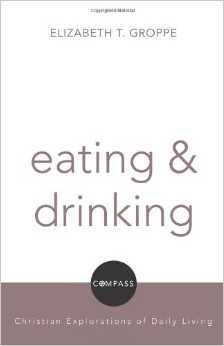 Elizabeth T. Groppe, Eating and Drinking (Christian Explorations of Daily Living), Minneapolis: Fortress Press, 2011, 49. I’m no vegetarian. I’ve confessed my love of meat before, not as virtue but simply a fact of preference and of my complete inability to conceive of a meatless kitchen. Adam Gopnik, The Table Comes First: Family, France, and the Meaning of Food, London: Quercus, 2011, 136. Zadok Perspectives is the quarterly journal of Ethos: Centre for Christianity and Society. It’s an award winning publication well worth a subscription. 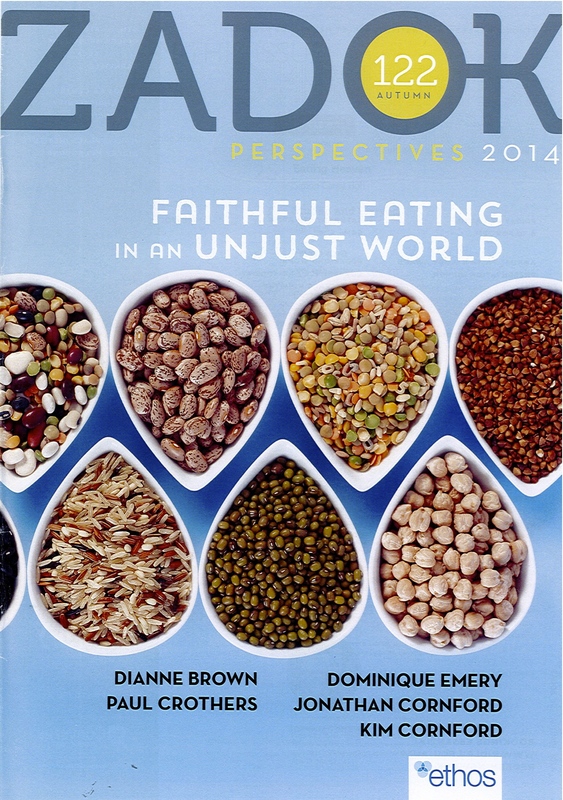 When it comes to issues of food, the latest instalment ‘Faithful Eating in an Unjust World’ is certainly worth a look. It includes some terrific articles on the big issues of agriculture and globalised food production from a distinctly Christian perspective. Economist, homemaker and community farmer Dianne Brown explores the contrast between industrial and sustainable agriculture and the Christian commitments relevant to our choices: the stewardship of creation, intergenerational justice, equity for agricultural communities and living humbly with the limits of human knowledge. Similarly, Jonathan Cornford (PhD), the founder of Manna Gum, provides a succinct biblical perspective on the challenges of global and local agriculture into the future. Both pieces are a challenging read. There are other articles that address the more personal and local application of faith to what and how we eat. 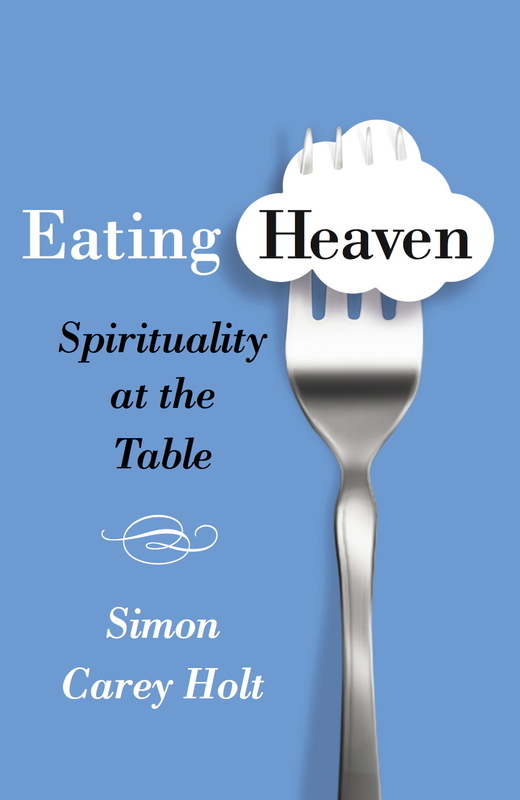 There’s Alison Sampson’s regular column on Everyday Spirituality prodding us toward ways we can ‘choose life’ in our shopping, cooking and eating; Paul Tyson’s and Paul Crother’s encouragements to acts of ‘micro-resitence’ in the face of large scale food production and supply; Dominique Emery’s testimony of juggling ethics, cost, nutritional needs and taste in the family home; an interview with Nick Ray on ethical shopping; and Kim Cornford’s inspiring story of neighbourhood food production and sharing. For me, the highlight of the issue is Dianne Brown’s stories of two farmers, Giuseppe in Tuscany (France), and David in central Victoria (Australia). Though on different sides of the world, both are working land that has been in their families for generations, and both are on the slow journey toward more sustainable farming practices. Their stories are a moving account of the extraordinary cost of change, the risks inherent to ‘radical’ action, and the layers of complexity in the economic, social and cultural challenges that are part and parcel of their journey. More than anything, it’s a reminder to people like me of just how easy it is to talk and how challenging it is to act.